Grapefruit reach their peak during the holiday season and cocktails (or mocktails) made with fresh squeezed grapefruit juice RULE! Do yourself a favor and pull out your citrus press. Prepared grapefruit juice at the grocery store works fine for this combo, but nothing compares to squeezing it yourself. 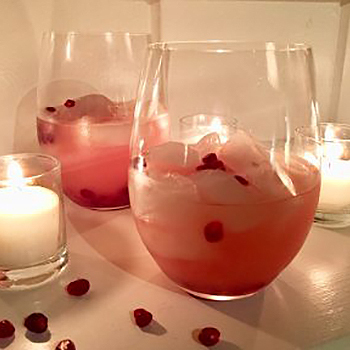 A splash of antioxidant rich pomegranate juice and a garnish with fresh pomegranate arils are sure to dazzle. Fill 2 cocktail glasses halfway with ice cubes. Add the vodka and grapefruit juice. Add the pomegranate juice. Stir and taste. Adjust flavor according to taste preferences. Garnish with pomegranate arils(seeds), if desired. Note: We prefer to strain the grapefruit juice to remove any pulp, for a very smooth texture. Do as you please!